Notwithstanding the title this article is just about the 8 wildcarders. If the article is too long there’s a combined FPL managers team for the 8 wildcarding FPL managers analysed towards the end of the article. The average score of the managers ended up GW34 was 44. That’s 10 points and 19% lower than the game average of 54. High score of the 8 was 54 and the lowest 40. The FFGeek poll was 49% Son and 14% Duffy. The site 1 poll was 31% Son and 20 Duffy% Mane. The top 10k was Son 43% and Duffy 23%. The schedule shows the players in the top 10k overall rank teams percentage wise vs the 8 top FPL managers I follow who are wildcarding. It’s therefore not a like for like comparison as 62% only of the top 10k wildcarded this week.. Updated; The top 10k average score is 49 so far compared to the 10 top managers average of 44. All the information is from the execellent site FPL discovery. Based on the percentages above, trippier should be Dunk or at least LaPorte. A lot of Fpl players will be rooting hard for Brighton this week. I’ve got two Brighton players but I’ll be rooting for them to concede. Lot of folk have three, or Duffy as captain. Correct Allan… the only thing I will be rooting for is a goal by Dunk… but that is not going to happen. The 2 defenders I left on the bench for Dunk and Duffy scored 8 and 9 points so the Brighton gamble is pretty disastrous. Every year, somewhere between the Ides of March and Easter, the ‘silly season’ kicks in. Bottom beat top et al. The usual 6 out of 10 predictions become a 2/3 out of 10. Am happy to take some risks during this window as at least there is some logic to it. Players scrapping to stay on the premiership dancefloor. For some reason I thought I could circumnavigate it this season with the race for 7th. Oh how wrong I was. Everton, Leicester and Wolves – gosh. Double up with a triple Brighton and I have had to refresh the FPL site multiple times to believe my rank drop is so limited. However, triple Brighton aside, I did not play my wildcard for GW 34. I played it for GW 35-38 and therefore I am keeping the faith in the process. The season long strategy. The delta this season is no summer football (seriously) and English success in the CL. Grateful to the geek and all the contributors that have helped me find a logical balance this season. And it gets worse for those with Deeney. Fortunately for me I have him on the subs bench but any ideas what is likely to happen with the suspension. Seemed like a harsh sending off from what I hear but will it be appealed successfully? Anyone know how long these things take? If Watford appeal would a decision be made before 11:30 Saturday? With Ryan and 2 Brighton defenders I had planned on replacing one of them for next week and bring in Mane for week 36. If Deeney is suspended I’ll have to either take a huge risk the Brighton defence improve, have them hogging 3 of my sub spot (and with squad rotation still being likely to take the risk) or take a hit. Any recommendations? I have deeney and knockaert, plus double brighton defence. Was in 14,000 overall rank, who knows where im dropping too. Absolute shambles of a wildcard. The wildcard isn’t just for this week so hopefully you will have a good BB next week (if you still have it). Even this week isn’t over yet Knockhaert scoring and a Bright clean sheet tomorrow will help you along. 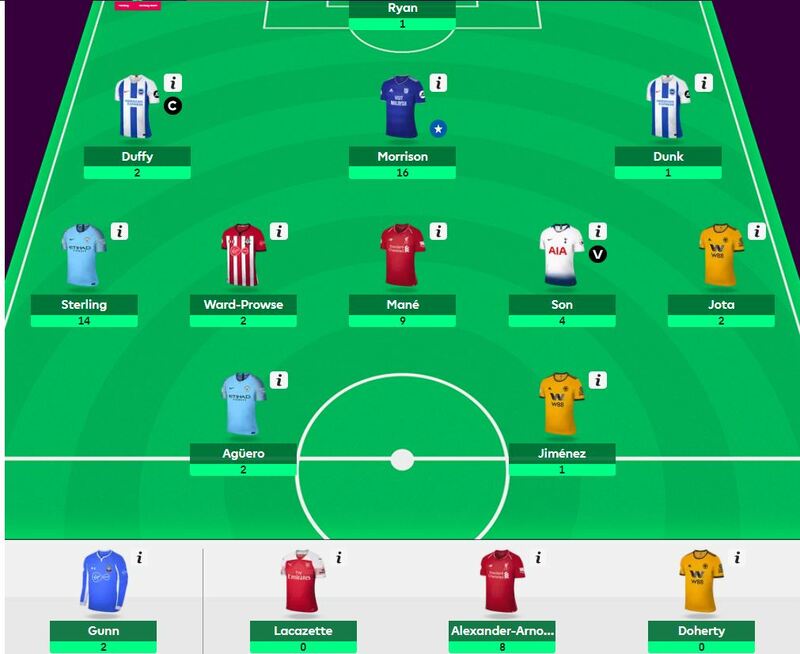 I went “quadrouple” Brighton defence with Duffy as captain, but managed to pick up points with Pogba and Sterling TAA and Erikson, I am on 52 points with a small green arrow as of Sunday night from 42k to 38k. A Brighton clean sheet tomorrow and things will be very good another hammering for Brighton shouldn’t affect me too much as few people will have Cardiff players, but it will make me nervous for next week. Knockaert is suspended for the cardiff game this week right? Any thoughts for the team lads? I have already taken – 4 but I’m tinkering with the idea of bringing in more city attack or a Liverpool attacker for GW35. BB is active so all are in play. 5.5m ibt, current plan is to bring in salah and mane for Huddersfield game but I’m also considering sterling, kbd. It’s a bad week when the highlight of my DGW was last night when I had no one playing. Already 12 below the average, I was dreading the Deeney/Lacazette points haul. Three players that I dropped got more points than my entire team – TAA, Pogba and Wilson. If you don’t laugh you’ll cry. I had the Brighton trio of disaster (who’s idea was that? 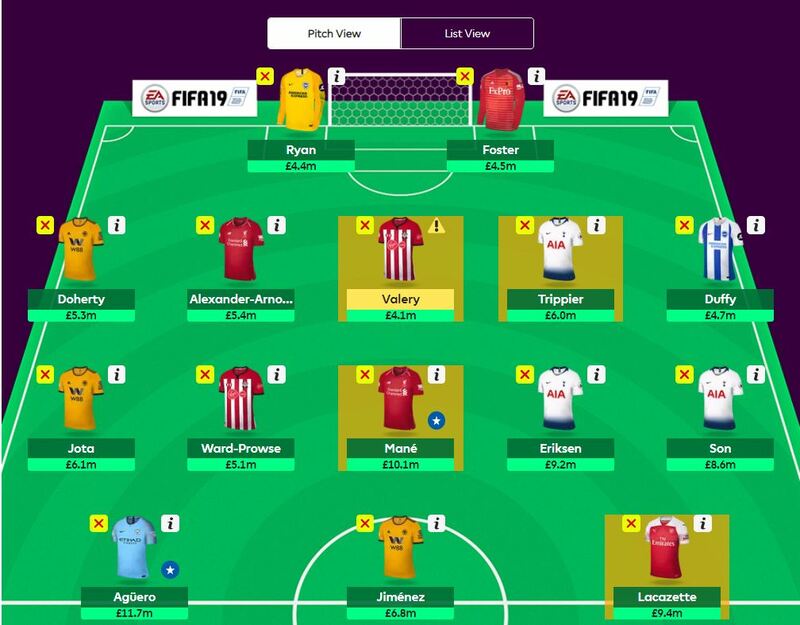 ), Trippier, Deeny & Aguero & Jiminez returning a combined total of 1 point. 1 point from 7 starters (after widcard) – surely that has to be a record? I also felt the burn of a Brighton trio! But I was able to make something from Jiminez (C), Sterling, Mane and van Dijk (points not necessarily in that order). I thought Sterling would be rested v CPalace, that was a mistake. Anyone think A.Gray is worth a punt? I’m preferring Doucoure over Gray… I even gambled with Success. Watford has two relatively easy games for GW 35.
i do feel better for having read this thread, misery loves company. #metoo! Same here Tony. That was my worst placing (over 5 million) of the whole season. And I hand picked the team. Random thought; I think Cardiff could get a draw v Liverpool.